(HealthDay)—More men could receive PSA blood tests for prostate cancer under revised guidelines released Tuesday by the nation's leading panel on preventive medicine. The U.S. Preventive Services Task Force (USPSTF) now recommends that men aged 55 to 69 decide for themselves whether to undergo a prostate-specific antigen (PSA) test, after talking it over with their doctor. This blood test looks for a protein produced by the prostate, a small walnut-shaped gland that produces seminal fluid. Cancerous prostate tissue produces higher levels of PSA. Until now, the task force has taken a hardline stance that no men receive PSA screening for prostate cancer. That's because relatively few men diagnosed with prostate cancer die from the often slow-moving illness. On the other hand, treatment frequently results in erectile dysfunction and urinary incontinence. However, new data shows that more men are opting for "active surveillance"—not treatment—of their diagnosed prostate cancer, making screening potentially less harmful, said USPSTF Vice Chair Dr. Alex Krist. Under active surveillance, doctors do not treat the cancer but instead keep a watchful eye on it to make sure it doesn't become aggressive—sparing patients the harms caused by surgery or radiation therapy, said Krist, a professor of family medicine at Virginia Commonwealth University. "It used to be that only 10 percent of men got active surveillance, and now in 2018 it's closer to 40 percent," Krist said. 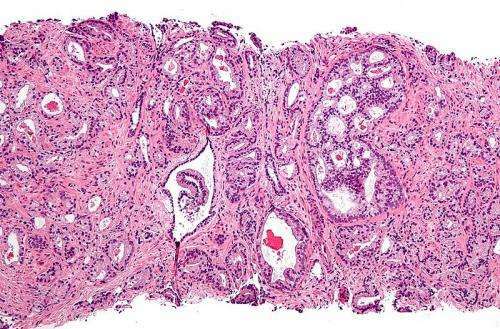 Fresh results from ongoing clinical trials also firmed up data showing that out of every 1,000 men who get a PSA test, 1.3 may avoid death from prostate cancer and three may avoid cancer spreading to other organs, the panel's evidence review concluded. "It's a small increase, but it was one that gave us some confidence that some men might not die from prostate cancer if they get screened," Krist said. USPSTF recommendations are very influential, in that the Affordable Care Act requires that insurers cover the full costs of any screenings the task force recommends. The USPSTF still recommends against PSA screening for men aged 70 or older. The new recommendation means that the USPSTF and leading medical societies are "all saying the same thing now," said Dr. Otis Brawley, chief medical and scientific officer for the American Cancer Society. The cancer society and the American Urological Association (AUA) already have guidelines saying that middle-aged men should have the option of receiving a PSA screening after talking with their doctor. The cancer society guideline calls for men to have the option starting at age 50, while the AUA sets 55 as the earliest age for routine screening. Both recommend against screening for men 70 and older. Brawley said the USPSTF has provided a valuable service by making sure that clinical trials produced quality data. "What happened along the way is the task force is really the entity that forced the development of data, forced the studies to be completed," Brawley said. "No one is saying 'I think' anymore about the benefits and harms of prostate cancer screening. Everybody is saying, 'This is what the data says.'" 240 will get a positive result, but only 100 will have cancer confirmed. 80 of those 100 with confirmed prostate cancer will have surgery or radiation treatment, either immediately or after a period of active surveillance. Of those 80 who receive treatment, 50 will suffer erectile dysfunction and 15 will suffer urinary incontinence. "About two of three men treated will have erectile dysfunction, and about one out of three men will have some degree of incontinence. These are significant harms," Krist said. Krist added that about 40 percent of the men with confirmed prostate cancer will never be affected by their cancer, and will wind up dying from something else. Brawley agreed that the increased use of active surveillance has made prostate cancer screening much less potentially harmful. "Men are actually being told, your treatment is watching. Observation is a form of treatment. You do not need aggressive treatment with surgery or radiation," Brawley said. Although the clinical data have provided some clarity regarding who should be screened, Krist said, they also show the need for a better screening test for prostate cancer and improved treatments. The task force also calls for more research in this area, including ongoing studies looking at the potential for MRI and genetic testing to better detect aggressive prostate cancers, Krist added. The panel is also asking for more research into high-risk groups, such as black Americans and men with a family history of prostate cancer. The new guidelines were published in the May 8 issue of the Journal of the American Medical Association.